The access to non-formal and extension education is limited for females in Pakistan. In this case study of district Muzaffargarh, a multi stage random sampling technique was employed. Main findings indicated that majority of husband and wife respondents were illiterate. Women received relatively less benefit from different sources of information that not only hindered them to avail better sources of employment but also made their position pity at home and community level. These women were also neglected by Agriculture Extension Department where all the extension agents were male who were restricted socially, customary and religiously to meet with women farmers which ultimately resulted in quite serious state of gender inequality in the field of extension education. 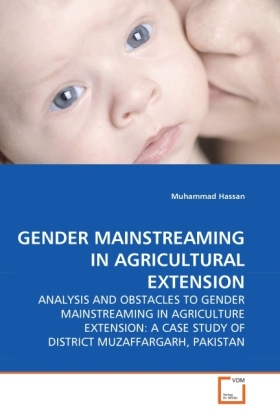 The main obstacles to gender mainstreaming in Agricultural Extension include restriction to meet males other than blood relations, socio-economic insecurity, inadequate political empowerment, improper transportation, residential problem for female extension workers, and male ego in respect of their vested dominance.